Heat oil in a wok or kadrahi. Heat oil in a wok or karahi. Add panch-pooran (you can use nigella seeds alone) and asafoetida, allow seeds to splutter. Add ginger and garlic and fry for a minute or so, until light golden. Add cauliflower, salt and all the spices and mix. Cook covered on medium to low heat, stirring gently from time to time, until cauliflower is tender. 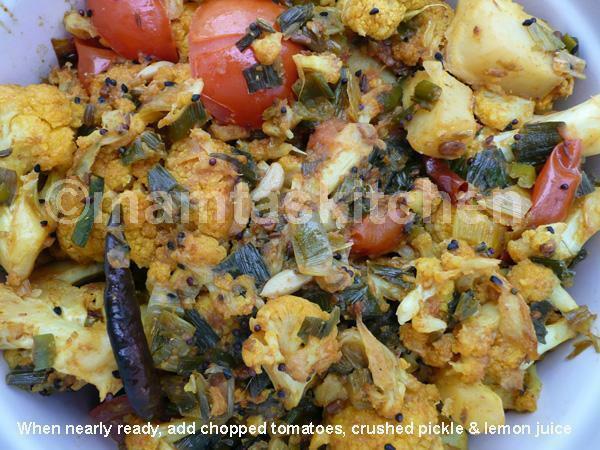 Add lemon juice, tomatoes, pickle and stir gently (cauliflower should not become mashed) on high heat, until all the liquid has been absorbed and vegetable looks shiny. If you have a few spring onions, chop their greens add them too, they look and taste nice. See pictures. Healthy option: Reduce the amount of oil for cooking and use a non-stick pan.